Zack Campbell ’18 – Waking up at 7:30 A.M. in Rome is so much better than waking up for an 8 A.M. in Crawfordsville. After a night of much needed sleep, the group set out on what would be one of the greatest and longest days of our lives. Our first stop was in the middle of the city at the Roman Forum. We walked among various ruins of Roman era architecture and even under a couple of imposing arches. From there we started to follow the Via Sacra (Sacred Road). The greatest of Rome’s inhabitants whether they were senators, conquering generals, or newly stated emperors walked the same trail that we walked on today. For me, the moment I realized the significance of the path my feet were walking on was the most humbling and appreciated moment I have had here so far. We were re- tracing the steps of men like Marcus Aurelius and experiencing similar scenery that he would have as we followed the Via Sacra through the shadow of Palatine Hill (which provided the most extraordinary view of the entire forum and city), by other structures such as the massive Basilica Nova, under the Arch of Titus, and finally leading us to the street by the Flavian Amphitheater (Colosseum). Pictures do not do the Colosseum justice. It is magnificent and left me not only speechless but also wondering how men 2,000 years ago accomplished creating such a tremendous piece of architecture. It truly makes one appreciate the history of the structure and the people who built it even more. The visit to the Colosseum wrapped up our tour of ancient Roman ruins just in time for a quick ride on Rome’s subway to a street close to the Vatican where we stopped to eat lunch at an amazing (and affordable) restaurant that served the absolute best Cannoli. After filling ourselves with some Italian cuisine, we headed to the Vatican Museums. Being an Indianapolis native I felt that my experience in museums was pretty successful considering the quality of the Indiana State museum and the Children’s museum. Boy was I wrong. The Vatican Museum had a massive collection of thousands of pieces of architecture and artwork that ranged from early 2nd century to modern day contemporary pieces which could put the majority of museums to shame. We began our tour by walking through an exhibit that was normally closed to the public and had artwork form early the early Christian time period. We walked further and further into the museum’s maze-like halls until we reached the Sistine Chapel. For the third time that day I was left speechless. The Sistine Chapel forgoes no detail. Every inch of the walls, windows, and ceiling depicted a biblical story/religious reference which looked as if angels had descended from heaven and painted them there themselves. It was an absolutely remarkable and perfect way to end our day……except that being Wabash men, we don’t clock out at 5:30 P.M. Instead of going back to our hotel we headed over to the Stadio Olimpic to watch SS. Lazio and Fiorentina duke it out in a European Soccer match. I think it is safe to say that all of us had a blast and were completely mesmerized by the entire experience. The game was good (Lazio winning uncontested 4-0) but I think the atmosphere created by the fans is what I enjoyed the most. The fans were fanatical. The crowd expressed their joy and displeasure in quick outbursts, and would rally and sing various songs throughout the match in unison. I couldn’t stop laughing at the emotional outbursts from an Italian women sitting two rows ahead of me. She was 4’5” of pure emotion and was not afraid to voice her displeasure (all of which was in Italian but cursing at sporting events seems to be easily recognized cross-culturally). Overall it was a great day as we got a taste of Roman history, Christianity’s history, and Italian culture. Johnny Bojrab ’16 – The final day of our trip to Rome gave us the opportunity to learn on our own about particular churches. The church that my fellow group members and I visited was located on top of first century Christian houses. This was an amazingly well-preserved location which was intricately designed with frescoes depicting early Roman/Christian art. Houses like these were the original sites of churches in Rome. Since Christians were highly persecuted in the first century these specific house churches would allow for worship without raising too many eyebrows in Ancient Rome. Interestingly this was in complete contrast with the other churches we had been visiting that week which were erected in visible areas and were specifically meant to grab the attention of others. Once Constantine had made Christianity the official religion there was no longer a need for these secretive house churches of the past since the religion itself had seemed to went through a complete paradigm shift in the sense of converting new members into the faith. It was incredible standing within these time capsules of Christianity, each particular church holding a different style that met a different purpose in the minds of many roman emperors. Christianity was a powerful movement that was able to meet the demands of heavily subjugated people. It was also able to be utilized as a powerful political tool to help legitimize authority. It was profound to be standing in a room that began the worlds most powerful and expansive religion in its infancy stage. Brian Gregory ’18 – As I sit here in Philadelphia airport, after having already experienced the longest flight of my life, I find myself wanting more of Rome. You don’t get to experience anything as beautiful, ancient, or thought-provoking in America. Most of that history was lost due to oral traditions being forgotten or erased. In Rome; however, every street is historical and every house built upon others of centuries past. Even with all of the majesty of Rome’s past, what keyed more into the experience was how clear it was that these early Christians were just everyday people. They lived their lives and faced persecutions as any other person could. They walked the streets now buried by the modern Rome, but their impact is seen in every basilica we visited. With that in mind, the impacts of the Roman Empire and the early Christians expands far past just Rome. My appetite has only been teased. Italy beckons me more than ever before. I want to travel underneath those houses and basilicas, I want to dine in front of the Pantheon (again), I will keep going back to Italy and Rome. Zechariah Banks ’16 – Greetings From Rome! This trip has been an amazing experience thus far. We have traveled almost everywhere in the city. We have seen things such as the Roman Colosseum, but also many lesser known things such as The Baths of Diocletian. Before coming on the immersion trip everyone was given a site to do a presentation about informing the class on the history and significance of the site. Today I gave my presentation on the Baths of Diocletian which were very imposing on the city of Rome. Commissioned by Co-Emeperor Maximian in the late 3rd century, the baths served as an everyday cleaning opportunity for Romans, but also an everyday release. The baths have now been converted into a church which was originally designed by Michelangelo during the 16th century. Today we also visited the catacombs, where many early Christians were buried. Catacombs are simply underground graves in which multiple casket spaces are carved from the earth walls and then filled with bodies. These were very important because they provided enough room to bury the massive number of people that died, while at the same time limiting the space used. The catacombs we visited are nicknamed the “Queen” catacomb due to the importance of the people buried there in the Christian faith. There were multiple martyrs and a large number of Popes buried in these catacombs. The food here is great, the weather is warm, and the people are nice. My first time in Italy is going great! Tyrone Evans ’16 – On the final day of our adventure in Rome, my self and three other gentlemen on the trip were given the opportunity to do some research on a few churches within the city. The catch was that we would have to plan out the visits and navigate our way to each church ourselves. This worried me a little bit at first because I was used to following Dr. Hartnett around the city since he knew it so well. But lucky our group was well prepared, we had all the locations, the times they opened, and jobs for each person at each church. Since I had been snapping photos the whole trip, I was the designated photographer. For the first church, San Crisogono, was tough to find at first, but thank God for the kind citizens of Rome and their helpful directions. The Church of San Crisogono was beautiful, and underneath the church laid the remains of a 4th century church, including multiple mosaics, ancient architecture, and even human bones! The second church we visited was the Church of Santa Cecilia, which was another small church close to the Tiber River. This church also had a crypt, which held old silos for grain storage and well preserved chapel underneath the church. Finally, the last church we visited was the Santa Sabina, a huge church on the opposite side of the Tiber River than the first two churches. This church wasn’t as immaculate as San Crisogono and Santa Cecilia, there was only a few mosaics. But right outside the church, there was a beautiful courtyard that provided a great view of the entire city. Later that night, we shared our last meal in Rome together. We were served course after course, eating foods such as octopus, a ham,egg, and cheese pasta, and multiple types of meat. Overall, I had an amazing time. With this being my first time out of the country, I thought I would never be able to partake in an experience such as this. But now that I have, I can’t wait to go back! Brady Boles ’17 – Before coming to Rome, we had learned the importance of Rome in its power as a city and as an important symbol for the emergence and growth of early Christianity. However, I had not truly appreciated the historical significance of the various pieces of architecture of the city and what they told about the emperors, early Christian figures, and even the everyday normal folk of the empire. Everything about the trip was extremely fascinating, fun, and informative, but my favorite parts of the trip were the trips to Ostia and the various Constantinian basilicas. It is hard not to have your breath taken away when walking into the various basilicas. The size of each one was absolutely massive and you could feel the power of the building before you even walk inside. As you walk inside, you feel even more overwhelmed, not only by the size, but also by the vivid Christian imagery and relics present within the building. During my reflection, I appreciated the building’s ability to portray Constantine’s intention to show his power and leave his mark on history by building these massive basilicas. For me, these structures highlighted one of the main themes of Ancient Rome, the importance of being remembered, being great and powerful, and carrying on the family name. I was also taken aback by the artistry present in each of the basilicas. Not only are the mosaics and paintings truly beautiful, but they had an impact on me in that they reflect how far Christianity has come in the previous centuries. In the early centuries after Christ’s death, Christianity had been a private religion that had experienced persecution under several emperors. Then in the 4th century, some of the biggest and most significant buildings had been built as churches for Christianity, reflecting the religions transformation into the more public, majority religion of the empire. The basilicas beauty also marked the importance of artistic skill during those times and it really made me appreciate artists in general. It also left me disappointed because in many modern cultures, including the United States, artists struggle finding any work. These Roman artists had an important task of creating artwork that characterized religions and the Roman Empire and it really made me realize how much I take creativity and artistry for granted. I also loved Ostia and the way it contrasted these basilicas. It allowed us to take a day to experience life of the everyday Roman citizens instead of just remembering emperors and major Christian figures. It was amazing to look at some of the homes of these people and to imagine what sounds, sights, and smells were present. I also loved my site, the Piazzale delle Corporazioni. It was amazing to see how a simple portico transformed into the center of commerce for a booming empire. It was rewarding to see the different mosaics in each of the offices that represented the growing diversity and grasp that the Empire had on the world. Ostia reminded me that it is important to understand how the everyday citizen lived. Aside from the course material, this trip was invaluable in that I got to live in a beautiful city for a week with great people, great food, and a great atmosphere. I learned that aside from the language barrier, the Italian people are not so different. They are proud of their history, live a fast -aced life, and love to have a good time, just like many of us Americans. It was exciting to see the subtle and major differences in our ways of life, whether it be the food we eat or the chaos that is the streets of Rome. I got to see and learn about some incredible things in Rome and enjoy them to the fullest thanks to the teachings of Dr. Hartnett and Dr. Nelson. I also became closer with some of my Wabash brothers and was able to create memories that I will cherish for a long time. I’d like to thank Dr. Hartnett, Dr. Nelson, and Wabash College for making this trip possible. Christian Beardsley ’16 – Today has been a very unique and bizarre day, one that I will never forget. being a Christian, today was especially important and spectacular because it was personally very uplifting seeing the multitude relics, frescos, and mosaics. Personally, my favorite ones were at the Santa Croce in Gerusalemme. Coming into the church I was not too impressed at the overall state of it or anything within its walls; however, the side chapels would prove to hold many different things that would alter the simplistic mindset that I was in. In the side chapel, we saw the nail of the cross of Christ, the thorns of His crown, and even the shroud of Jesus. I was amazed when I saw all of these things and am very blessed to have been given this opportunity to have done so. This trip has taught me many things along the days involving the beginning of Christianity and the early parts of the Roman Empire, even the culture of the people who live here. Another thing I have learned was that there were many changes made to the monuments of the ancient times so that they could build over the old and start again with the new on top. Christianity became a major religion and it was shown in the basilica and churches throughout the city. Even among the churches, there were many frescos and mosaics from the past centuries, underneath the new structures, that depict key stories within the bible. The stories would relate to the old and new testament and would also relate to that respective church in some way. Rome is very different in terms of how people live and interact with others. It is a very busy city, full of life during all times of the day. There is never a dull moment to be had whilst here. Overall, this trip has been a very unique and worthwhile experience, one that I will remember for the rest of my life. It has taught me much and has provided me with useful tools and perspectives to look upon the world, such as enjoy the smaller things as well as the larger things of life and to just experience new things that may seem different. I am very grateful to have this experience. Shamir Johnson ’17 – After waking up at a very early 7:30 it was time to make our way to the Catacombs of Priscilla, also know as the Queen Catacomb. It is named Queen Catacomb because it is said to have the most martyrs and 7 popes. Here we were able to get a picture of early Christian tombs. The tombs consisted of 3 layers of cemeteries which stretched 13 kilometers. The travel there was a bit lengthy because catacombs are only on the outskirts or outside the sacred boundaries of Rome. The location also helps protect from disease in the aorta of Rome. Nonetheless, in the Catacombs we were able to see authentic frescoes of Mary holding Jesus, the Good Shepherd, the Three Magi, and others. After leaving the Catacombs we made our way to the Church of Santa Costanzo and Mosoleum where the tombs of Constantine’s mother and daughter were both at one time and are honored. The Mosoleum was interesting because of the contrast from the other basilica we have visited these last few days, because of the circular structure the focus is at the center where the altar is located and immediately continues in a vertical way rather than a horizontal focus that is the norm for basilica. Immediately after leaving the basilica we stopped by “Heaven”. Don’t be be confused this was not the name of the restaurant, but just an implication of how good the food tasted. It was a buffet with meats, and cheeses, and pastas, and pizzas and green vegetables, and salads, and fruits, and vegetables, and deserts, and espressos. After indulging in the fruits of the heavens with our swollen bellies we made our way to a few Churches all which seemed to be in a ten-minute radius of each. I hope this gives you an idea of how many basilicas and churches Rome holds. It’s mind boggling; when you pass six churches in a ten minute walk. The churches each housed relics as well as offered visual aids in learning more and more about the Roman Christian and Early Christian architecture. Overall, after a little reflection it is another good day in the books as I impatiently wait for tonight’s feast. Ciao!! Cameron Brown ’17 – During my first two days in Rome, I have had a wide range of experiences. For example, on the first day here I was able to finally able to see and go inside the Pantheon. Being able to see, in person, one of the most iconic buildings in Rome was an amazing experience. It gave me the opportunity to experience first hand some of the architectural patterns, including the circles and squares that are repeated throughout the structure, that I learned about in a Roman architecture class last year. In addition to seeing this and many other structures, I was able to try out various cuisines. The first meal I tried, of course, was the pizza in Rome. This, as well as everything else I have ate so far, tasted amazing. In addition to the food and sightseeing, just walking around the city is an experience. The culture in Rome is completely foreign when compared to the culture in America, as exemplified by the drivers. From the perspective of Americans, they are absolutely crazy. However, there is something in the confidence of the drivers that creates a feeling of safety in the midst of the chaos. I was surprised to find that while public transportation is prominent in Rome, it does not seem to be the prominent method of transportation. If you look out onto any busy street you will see a mass of mopeds weaving in and out of traffic as well as lanes. I am very grateful to have been given this opportunity, as I have wished to come to Rome for as long as I remember. The culture, food, and even the drivers here have opened my eyes and given me an experience that I will not soon forget. Logan Anglin ’17 – Today in Rome, I was able to experience what it was like for an ancient Roman Citizen to live in everyday life back in the 1st-4th century. We visited a church and sat through and experienced a traditional Italian Catholic mass. In particular, for the bulk of the day, visited the city of Ostia, an ancient Roman Civilization located near the coast of the Mediterranean. What was really important about studying this city was that unlike Rome, there had been no renovations or building on top of preexisting Ostia buildings. So by examining this city, we were able to see a relatively uninterrupted since the time of its busy existence. For starters, just let me say how amazing it was to see this city and try to imagine how they lived and participated in everyday life. As we walked down the street made of large stones, there were worn down places only about 4-5 inches thick, which we learned were the result of years and years of wearing down and erosion made from the wheels of carriages. Immediately we began seeing direct evidence of a time in history where these ancient people actually lived here. This was the first real point in my trip where I was able to fully grasp the idea that this was an actual civilization that thrived and dominated the world nearly 2,000 years ago. All of the ruins we saw were simply amazing, like a time machine into the past. Especially since I plan on majoring or minoring in Classics, this helped me realize my true interests within the ancient world. I especially was able to appreciate the ruins because I have taken four classes of Latin at Wabash College. I was able to practice this skill in the churches, signs, and all over the ruins. It was more of like a jigsaw puzzle, using what we have learned earlier in the semester as a base of knowledge, then by examining the ruins and the Latin associated to it, we could better understand what the Roman’s would have been doing here in these exact spots many years ago. At one point in our tour with Dr. Hartnett through Ostia, he assumed the role of what a typical ancient Roman vendor would have done. The busy streets were lined with shops with large doors that offered good views of their insides and what they had to sell. Some of these buildings were very well intact and we were able to walk up the stairs into the second and third floor. These floors were meant as the living spaces for the store owners who worked on the first floor. At one point in the tour, we were told to imagine what we would have seen, felt, tasted, touched, and heard if we were living at the time. We imagined very busy streets, with smells of all kinds of tasty food, smoke, and trash. Smoke would have filled the air as everyone cooked their foods without gas. The most populated streets were probably jam-packed with people, constantly bumping and shoving into one another. Everyone was probably constantly shouting as the acoustics in the buildings were not very good, and with so many people, you would probably have to yell in order to hear each other. The types of food to eat consisted of all kinds of breads, fish that was caught just a few miles over in the Mediterranean, and types of fruit or vegetables. Even though this was my only second day here, it’s already been a trip of a lifetime as I have seen and learned so many things in the short time being here. It is hard to imagine that only 36 hours ago, I was in back in my dorm room at Wabash in Indiana. Jesse Caldwell ’15 – We were on our feet from 10 am Wednesday morning until about 5 pm. Although we were tired, the experience was great! We started the day by going to the Museum of Modern Art otherwise known as the MOMA. While at the MOMA we were lucky enough to see some of the most significant works of art that we have seen in text books the last few years of our education. In my opinion, the most significant work that we saw today was Pablo Picasso’s “Les Demoiselles d’Avignon”. The professors have been referencing the significance of this painting for my four years at Wabash. I was very excited to see the work in person. 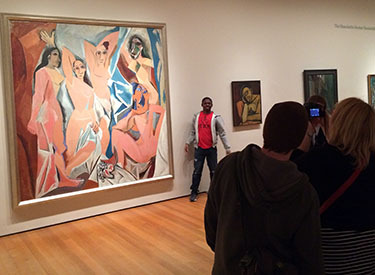 Students snapped pictures of and with MOMA paintings. When walking through the gallery, I turned a corner and saw this masterpiece. I instantly got cold chills. Everything I was told about this painting flooded back into my head and I got cold chills. I instantly took a step back and snapped a picture of it. As with any painting I see, I looked at it from afar and then slowly approached it while observing the brush work that the artist used. This work by Picasso carried a lot of weight in this room and the entire museum. This was the painting I had heard about for so long and here it was in front of me. In my student work at Wabash, I used photography as my medium. After seeing this work along with other powerful paintings such as “ The Starry Night” by Vincent van Gogh, I wished I had used painting as my medium. The work I saw on this trip will influence the way I approach the subject matter in my photography. These spectacular works of art were not the only things that kept us on our feet. A few of us spent time in Central Park. We escaped the loud and busy city into a place of quiet and peace. The park was very cool. The peaceful green space is being towered over by the harsh buildings of the city. After leaving the park and the MOMA, we went as a group to the 9/11 Memorial. This might be one of the most significant parts of the trip for me. In the space where we stood, there was totally chaos on that day on September 11, 2001. I believe the way the new building towers of the new memorial is very significant. I believe it is a symbol of strength that looks over the memorial and protects those who are around the area. The entire area brought cold chills to my body and I could tell that it affected others who were there. Wesley Virt ‘17 – Today, I was in awe with my surroundings. I was amazed at the ingenuity, creativeness, and mysteries that surrounded the sites we visited. Today we visited the Epigraphical Museum, the catacombs under St. Peter’s, and St. Peter’s Basilica. At the Epigraphical Museum I realized that Roman life is extremely diverse. After looking at artifacts in this museum, I saw various aspects of Roman life that I never thought existed. This included hair dressers, freedman (who were free in a unique sense), and musicians. I could see these unique characteristics of Roman life portrayed through artifacts that were collected in this museum. One artifact that stood out to me was a stone carving that dealt with a freedman who had two patrons to serve. I can’t image being a slave set free and serving not only one patron, but two patrons for the rest of your life! After this museum, we made our way St. Peter’s Basilica. We received the special opportunity to go underneath the basilica where we got the chance to see the necropolis and the tomb of St. Peter. I could not believe the intricacy of the paintings in the necropolis. These people buried in the necropolis under St. Peter’s really cared about what other Roman citizens thought about their life after death. After visiting the city of the dead we ventured back up to the land of the living to view the present day basilica. In the past, I have gotten the chance to visit the Cathedral Basilica in Missouri. So I naturally assumed that St. Peter’s would be about the same as this other basilica. I don’t think I could have been more wrong. While both of these churches were massive, St. Peter’s had so many details in every part of the church. It was an overwhelming experience just standing in the Basilica. As Dr. Hartnett warned us before entering the basilica, “If you try to absorb everything in St. Peter’s you will get a headache.” This couldn’t have been more of an accurate statement! Overall, I had a great day. I realized how much history lies within this city piled layers and layers deep.